Alaska has the lowest percentage of students from low-income families attending university in the country, according to the most recent data from the Pell Institute for Study of Opportunity in Higher Ed. There is a state-run grant program designed to help more low-income Alaskans afford college. But it only receives around half as much money as the state’s merit-based program. 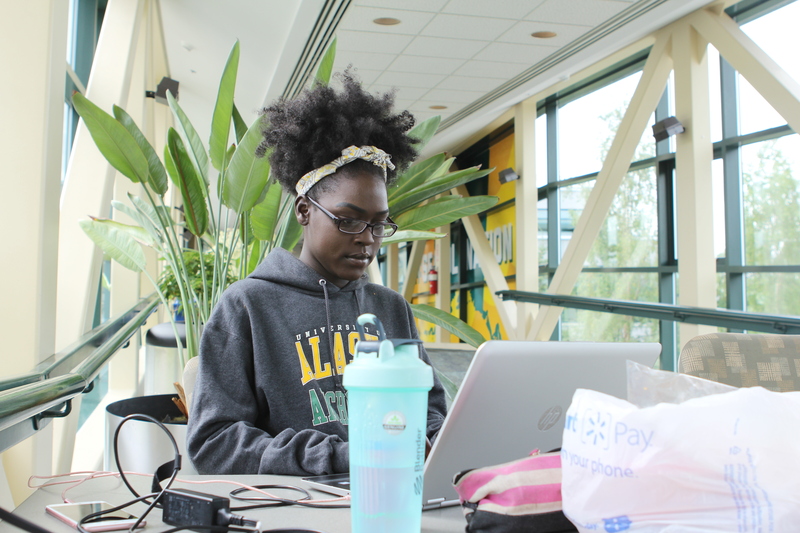 Nyariak Kuany studies accounting at the University of Alaska Anchorage. She and her two sisters are the first in their family to attend college. Kuany gets around $4,000 every year from two state programs: the merit-based Alaska Performance Scholarship and the needs-based Alaska Education Grant. She says she probably wouldn’t be at college without them. “And I just thought here’s what you have available. You can really benefit and profit off this award that you were given, um, why not take it,” Kuany said. Kuany’s mother immigrated from Sudan before she was born. She’s a widow and a single mom of eight. The federal financial aid application calculates that Kuany’s family can’t afford to pay anything to send her to college. But thanks to federal and state aid and a job at Olive Garden, she’s currently debt-free. “With those I actually haven’t paid any money out of pocket other than my parking pass,” Kuany said. But there are a lot of students in Kuany’s shoes who aren’t so lucky. Well over a thousand qualified low-income students don’t receive Alaska Education Grant funding each year. Around 40 percent of students with a financial situation similar to Kuany’s don’t receive funding. And that doesn’t include students whose families make a little bit more. That’s because funding for the program dries up before all the need can be met. In contrast, the merit-based Alaska Performance Scholarship funds everyone who qualifies. The Alaska Education Grant receives half as much funding as the Alaska Performance Scholarship, as outlined by state law. Only one in five students receiving that scholarship are low-income. To qualify, students have to take certain classes in high school, maintain a certain GPA and score well on standardized tests. So why prioritize one over the other? University of Alaska’s Saichi Oba said his sense is that the system is set up to value merit where people who do well in high school are rewarded. He’s the assistant Vice President of Student and Enrollment Services. “And I just don’t think maybe there’s enough understanding of what the real need is for low-income families who would like to send their child to college. Or a mother and father who would like to attend college themselves perhaps to finish a degree,” Oba said. The performance scholarship is also meant to keep college-educated students in state and contributing to the economy. Alaska isn’t alone in prioritizing merit-based aid. The Institute for Higher Education Policy‘s President Michelle Cooper says it’s a trend they’ve seen across the country. “Need-based aid continues to shrink as a share of the total state aid as compared to merit-aid which we see is on the rise,” Cooper said. Cooper said merit-based programs tend to be politically popular. They often give middle and high-income students more choices when looking at colleges. Need-based programs, in contrast, often determine whether low-income students attend college at all. “So it really promotes access. It helps students get into the door,” Cooper said. Not every state has state-run scholarship and grant programs, but most have at least one. Alaska’s programs — in their current state — were a product of the Parnell administration. The legislature has tried to cut funding or even eliminate both programs, mostly because of the state’s budget crisis. Both are currently funded through the Alaska Higher Education Investment Fund, which works like an endowment. Stephanie Butler is the executive director of the Alaska Commission on Postsecondary Education, the organization that runs both programs. She thinks there’s less funding for the need-based program, in part because it was tacked on to a bill at the last minute and because money for education is tight. She says, in general, the legislature sees the benefits of both programs. “Especially when we get a low-income student out of a dependency status, where they’re dependent on the state for income, and into workforce where they can earn a living wage. And that’s really transformative for generations and it’s also transformative for the Alaska economy,” Butler said. Butler said they’d love to be able to fund all low-income students, but for now, the Commission prioritizes who they fund based on factors like financial need and whether the student has received the award in the past. And that means students like Kuany are left wondering whether they’ll have to foot the bill for an extra couple thousand dollars every year. Kuany said right now, she plans to graduate in four years, but a cut to her funding could change that. If everything goes according to plan, Kuany will be working as an accountant by 2020. And she’s hoping that’ll inspire her younger siblings to go to college too and maybe even pursue graduate school. For a more in-depth, national look at the issue, check out this story from The Hechinger Report. Previous articleIs selective enforcement of Alaska’s ban on roadside advertising unconstitutional?